The above info came from Pedro, and was edited by yours truly (contact me). 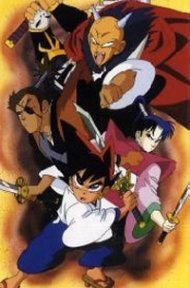 The image came from Yaiba el Pequeño Samurai. Yaiba is a young master swordsman who fights various demonic enemies and his governor The Devil of Wind "Takeshi Onimaru", using the magical sword called The Sword of God of Thunder. He stays with his father's old adversary, Raizo, and goes to the same school as Raizo's cute daughter, Sayaka Mine. The above description came from Pedro, and was edited by yours truly (contact me).